3,040,00,000,000 trillion (± 96,000,000,000 billion/0.096 trillion 95% confidence intervals). That’s a lot of cellulose (the most abundant molecule in plant cell walls & most abundant organic compound on Earth). I’ve written about how a billion is a big number before. Converting one billion into seconds is ~32 years. Doing the calculation one trillion is 31,688 years. So 3 trillion seconds = 95,054 years. We’re getting back into an un-relatable big number again. Using a 75-year lifespan for a human, that’s 1,267 human lifetimes. Doing the calculation for one trillion = 31,688 years. So 3 trillion seconds = 95,054 years. We’re getting back into an un-relatable, big number again. Using a 75-year lifespan for a human, that’s 1,267 human lifetimes. It’s a ratio of 422 trees per person on Earth. So there are a lot of trees. More than was previously thought. So what? Let’s get into the study and it’s implications. Figure 1 from Crowther et. al. 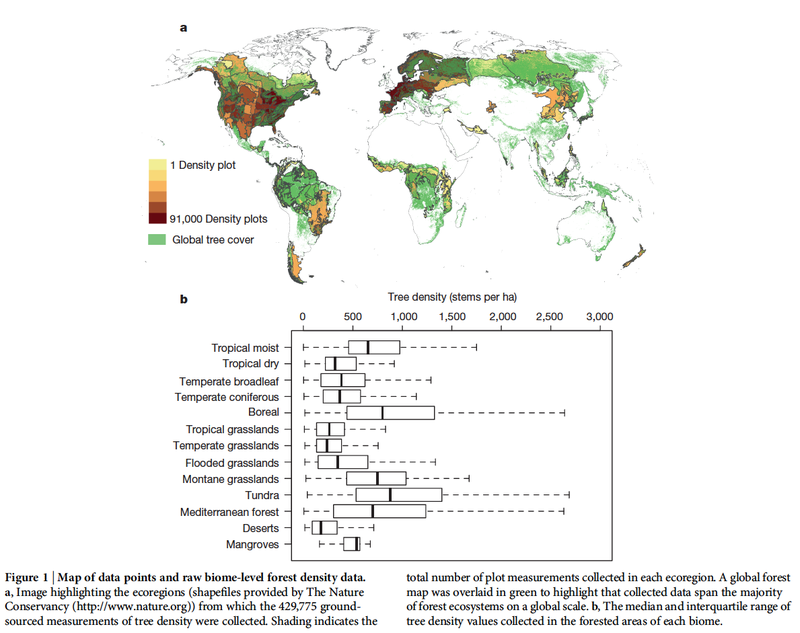 in Nature mapping global tree density and area. “Following almost all of the collected data sources, we define a tree as a plant with woody stems larger than 10 cm diameter at breast height (DBH)”. This may seem trivial, but plants in nature have a habit of blurring categories. For instance, bananas grow as huge plants that many humans might call a “tree”, but it is technically an herbaceous plant, not woody and so doesn’t count as a tree. Other plants are woody, but not tall enough/thick enough to meet the above definition. Just keep in mind there’s a lot more plant life in the world than the trees accounted for in the study. If want to know how big 10cm is, check out this internet ruler that calibrates to your monitor’s resolution. Previous estimates were that there were 400 billion trees on Earth. This relied largely on satellite data, measuring forested area and only a poor estimate of the number of trees in those areas. The density of forested areas was largely missing. This estimate was called into question in a paper a few years ago that came to an estimate of 390 billion trees in the Amazon basin alone from ground measured density in just over 1,000 sites (this ought to underscore just how important the Amazon basin is in terms of biodiversity & just how vast it is & will hopefully remain) (2). Crowther et al. combined satellite data with painstaking ground estimates from thousands of people counting trees all over the world (sites = 429,775 from over 50 countries, including 14 different biomes– ecologically defined environments like desert, tropical forest, tundra, boreal forest, etc) (1). Adding density to satellite data of extent of forest/tree cover, the 2-year data crunching effort lead to the new estimate, 7x bigger higher than it was before. The statistical analysis is impressive, contending with both fine scale local data and global data at once is not easy. As good as their model is, it is still an estimate; one subject to refining. More data can be added to improve the model, though this is a solid start. What does this new estimate mean? Although 3 trillion is a huge number, it doesn’t mean that we’re OK in terms of forests. There used to be twice as much forest. They estimate that humans currently cause the loss of 15 billion square kilometers for forests each year. Based on historical forest density estimates from the beginnings of human civilization, 46% of forested areas have been lost according to Crowther et. al. (1). Humans really do have an impact on the environment and have radically altered the Earth in many ways. This is just the latest example. 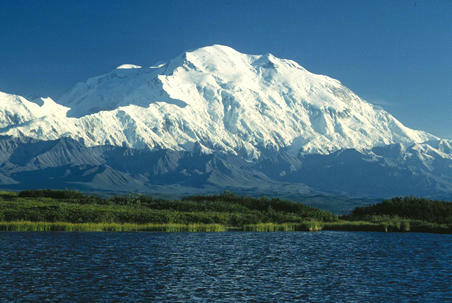 Trees and forests tend to harbor a lot of biodiversity. They also act as carbon sequestration mechanisms, pulling carbon dioxide out of the air to build themselves (as many photosynthetic organisms do). Forests also provide ecosystem services. This new estimate will hopefully improve models of climate change/forest carbon sequestration, help accurately assess conservation efforts as well as re-foresting initiatives. These data will help manage our forest resources and define what might happen as areas get de-forested or re-forested. And last, this data will add to our abilities to not only determine numbers of trees, but also perhaps begin to identify species living in given areas as the NASA Jet Propulsion Lab AVIRIS detector is capable of doing. It is interesting that the highest densities were seen in northern boreal forests, mostly made up of conifer/evergreen trees. These are a large number of the trees that are burning in the West Coast of North America (CA, OR, WA, British Columbia, Yukon Territories) and the state where I grew up: Alaska. (1) T. W. Crowther, H. B. Glick, K. R. Covey, C. Bettigole, D. S. Maynard, S. M. Thomas, J. R. Smith, G. Hintler, M. C. Duguid, G. Amatulli, M.-N. Tuanmu, W. Jetz, C. Salas, C. Stam, D. Piotto, R. Tavani, S. Green, G. Bruce, S. J. Williams, S. K. Wiser, M. O. Huber, G. M. Hengeveld, G.-J. Nabuurs, E. Tikhonova, P. Borchardt, C.-F. Li, L. W. Powrie, M. Fischer, A. Hemp, J. Homeier, P. Cho, A. C. Vibrans, P. M. Umunay, S. L. Piao, C. W. Rowe, M. S. Ashton, P. R. Crane & M. A. Bradford Mapping Tree Density at a Global Scale. 2015. Nature. doi:10.1038/nature14967 ($). (2) Hans ter Steege, Nigel C. A. Pitman, Daniel Sabatier, Christopher Baraloto, Rafael P. Salomão, Juan Ernesto Guevara, Oliver L. Phillips, Carolina V. Castilho, William E. Magnusson, Jean-François Molino, Abel Monteagudo, Percy Núñez Vargas, Juan Carlos Montero, Ted R. Feldpausch, Eurídice N. Honorio Coronado, Tim J. Killeen, Bonifacio Mostacedo, Rodolfo Vasquez, Rafael L. Assis, John Terborgh, Florian Wittmann, Ana Andrade, William F. Laurance, Susan G. W. Laurance, Beatriz S. Marimon, Ben-Hur Marimon Jr., Ima Célia Guimarães Vieira, Iêda Leão Amaral, Roel Brienen, Hernán Castellanos, Dairon Cárdenas López, Joost F. Duivenvoorden, Hugo F. Mogollón, Francisca Dionízia de Almeida Matos, Nállarett Dávila, Roosevelt García-Villacorta, Pablo Roberto Stevenson Diaz, Flávia Costa, Thaise Emilio, Carolina Levis, Juliana Schietti, Priscila Souza, Alfonso Alonso, Francisco Dallmeier, Alvaro Javier Duque Montoya, Maria Teresa Fernandez Piedade, Alejandro Araujo-Murakami, Luzmila Arroyo, Rogerio Gribel, Paul V. A. Fine, Carlos A. Peres, Marisol Toledo, Gerardo A. Aymard C., Tim R. Baker9, Carlos Cerón, Julien Engel, Terry W. Henkel, Paul Maas, Pascal Petronelli, Juliana Stropp, Charles Eugene Zartman, Doug Daly, David Neill, Marcos Silveira, Marcos Ríos Paredes, Jerome Chave, Diógenes de Andrade Lima Filho, Peter Møller Jørgensen, Alfredo Fuentes, Jochen Schöngart, Fernando Cornejo Valverde, Anthony Di Fiore, Eliana M. Jimenez, Maria Cristina Peñuela Mora, Juan Fernando Phillips, Gonzalo Rivas, Tinde R. van Andel, Patricio von Hildebrand, Bruce Hoffman, Eglée L. Zent, Yadvinder Malhi, Adriana Prieto, Agustín Rudas, Ademir R. Ruschell, Natalino Silva, Vincent Vos, Stanford Zent, Alexandre A. Oliveira, Angela Cano Schutz, Therany Gonzales, Marcelo Trindade Nascimento, Hirma Ramirez-Angulo, Rodrigo Sierra, Milton Tirado, María Natalia Umaña Medina, Geertje van der Heijden, César I. A. Vela, Emilio Vilanova Torre, Corine Vriesendorp, Ophelia Wang, Kenneth R. Young, Claudia Baider, Henrik Balslev, Cid Ferreira, Italo Mesones, Armando Torres-Lezama, Ligia Estela Urrego Giraldo, Roderick Zagt, Miguel N. Alexiades, Lionel Hernandez, Isau Huamantupa-Chuquimaco, William Milliken, Walter Palacios Cuenca, Daniela Pauletto, Elvis Valderrama Sandoval, Luis Valenzuela Gamarra, Kyle G. Dexter, Ken Feeley, Gabriela Lopez-Gonzalez, Miles R. Silman. 2012. Hyperdominance in the Amazonian Tree flora. Science. 342 doi: 10.1126/science.1243092 ($ for full article). Pingback: Reach For The Sun.